Translation: Jacob, son of Louis & Anna Schumm, died 27 October 1855, age 9 years, 27 days. Johann Jacob was the fourth child born to Ludwig and Barbara (Pflüger) Schumm. Johann Jacob’s birth and death information was contained in the records of Zion Lutheran Church, Schumm. According to their baptism records he was born 30 September 1846 and was baptized 9 October 1846. Sponsors at his baptism were Johann Jacob Schumm [his uncle] and Christian Pflüger [his grandfather]. Johann Jacob is buried in same row as his brother Georg, with only two tombstones separating the brothers. 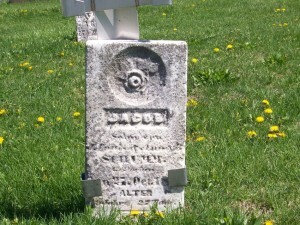 Georg died in 1857 and was featured in last week’s Tombstone Tuesday post. Johann Jacob’s parents were born in Württemberg and married in Holmes County, Ohio. Johann Jacob was born 15 days after the death of his grandfather Johann Georg Schumm, the immigrant and founder of Schumm. Johann Jacob’s father Ludwig died just two months before Johann Jacob. His mother Barbara died in 1908. What does it mean to population dynamics that just a few years ago “sickly” children died and thus dropped out of the genetic pool, while today, even the very “sickly” survive and have families of their own?